When we hop forward to 20th Century AD we find the Egyptian Mau cat more or less forgotten. Cat fanciers did work on developing the breed in France, Italy and Switzerland and the breed was actually shown at the beginning of the century. Then came World War II and the Egyptian Mau Cat breed was basically wiped out. If it wasn't for a Russian princess, this breed might not exist today. But thanks to Natalie Troubetskaya we have this beautiful, rare breed. She studied medicine in Moscow and was a nurse in Russia during the World War I. After this she moved to England, and during World War II she served as a nurse for US forces in Rome. She stayed in the Eternal City, and in 1952 the story of the modern Mau begins. There are two versions of the story. The first one is that Natalie Troubetskaya met with the Egyptian Ambassador to Italy and met his cat, a Mau. This cat made such an impression that the Princess asked the Ambassador is he could obtain for her several such feral cats. This story mentions her importing a female street cat from Cairo and mated it with a local, Italian tom cat. The other story about the saving of the Egyptian Mau Cat also involves a Middle Eastern Diplomat. According to this story a Syrian diplomat gave a little spotted Mau kitten to a little boy. And this boy then brought the kitten as a present to the Princess. The Princess thought the kitten was exceptionally beautiful and became curious if it might be of a specific breed. After doing some research she became convinced it was an Egyptian Mau cat. She rescued more Maus, getting at least one through the Syrian embassy (this might be the part in the other story about obtaining cats from Cairo). The first Maus were a black male called Gregorio , a silver female Lulu and a smoke male Geppa. The first Mau litter was born in Italy in 1953, and the second in 1954. Princess Troubetskaya exhibited these kittens in Europe. She wrote the breed standard and her breeding program created the basis for the modern Mau. Does your cat smell something and then stop and look funny - mouth half open, looking like it considered the smell odd? This is called the "flehmen response" and it means your cat finds the scent interesting and is gathering more information. It is using the so called "Jacobson organ" to taste the air. This organ opens to the roof of the cat's mouth. It is lined with olfactory receptor cells which then transfer the information gathered to the cat's brain. She move to US in 1956, bringing with her two silver females Liza and Baba - the latter, the daughter of Geppa and Lulu, was to become the matriarch of the breed. She also brought a bronze male JoJo , also known as Girogio, whose parents were Baba and Gregorio. Once in the States Princess Troubetskaya established her Fatima cattery and the Maus started conquering the hearts of cat lovers first in the US and then around the world. Obviously with so few cats to start the breeding program, the gene pool was limited.Some outcrosses were imported. For example Jean S. Mill rescued two bronze cats, a male and a female, from the Delhi Zoo rhino pen of all places. These cats looked like Maus and from them the "Indian line" was craeted. 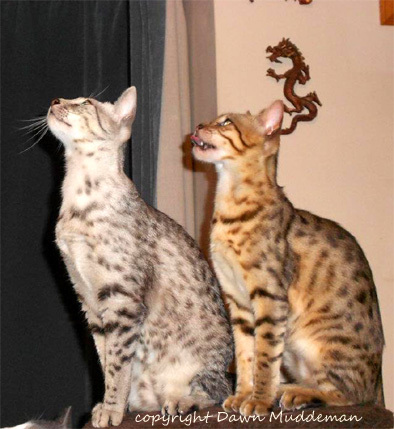 These two cats made the bronze color of the Mau that much richer (before them the bronze color was more like a sandy brown than rich copper ). In addition to that they cause the spotting contrast to become stronger and brought the "glitter gene" too. Imports are still used in the breeding- mostly directly from the streets of Egypt, but also from India. This is important to keep the gene pool healthy. Great care is taken to choose the right cats as not every cat is an Egyptian Mau - they have to have the correct breed characteristics to qualify. And actually this is saving the cat in its home country too. Cats are not much appreciated in today's Egypt - they are rutinely poisoned and suffer from various diseases. In the 1960's there was an attempt to create a cat looking like the ancient Mau by other means. Angela Sayer from Great Britain created what today is the Oriental Spotted Tabby (imagine a Siamese cat with fine spotted-tabby markings). 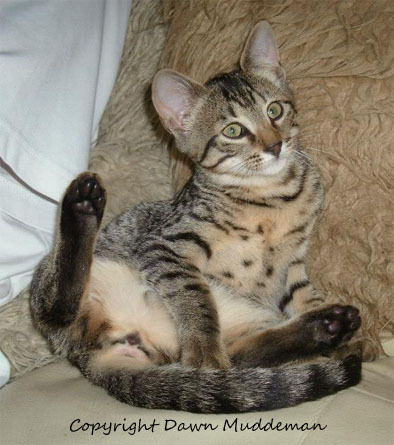 This breed was also called at first "Egyptian Mau" in the UK, which may still cause a bit of a confusion these days. As a result of this selective breeding Egyptian May today is a healthy breed, generally free of many illnesses. 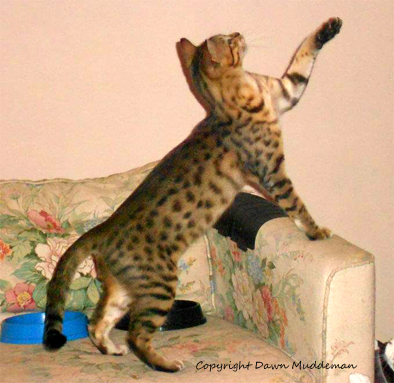 And what is it like to live with an Egyptian Mau? Thank you Dawn Muddeman allowing me to use the photos of your beautiful Maus in this article. 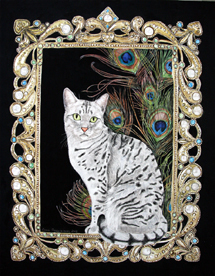 Above is a picture ofa gouache painting of a beautiful silver Egyptian Mau, Qetesh. Click on the picture or HERE if you wish to see the painting in more detail and read Qetesh's story. Do you have a beautiful Mau? Click here to share pics and the story of your Mau!